The module that holds the biofilm. 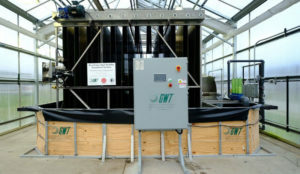 The central Iowa town of Slater will be the first city in the state to try a new wastewater treatment process that uses algae to remove ammonia as well as other nutrients. The technology was created not far from Slater at the Ames-based Gross-Wen Technologies. Max Gangestad is the company’s spokesperson. “It’s called the revolving agale biofilm…typical algae grows in suspended liquid, think about the algae growing in a lake, it mixes in the lake. Our system grows on what’s called a biofilm,” Gangestad says. That biofilm is dropped into the wastewater. “It’s a rotating belt that goes down into the water and spends most of its time out of the water. 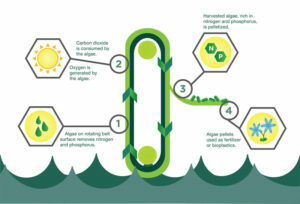 So it is able to grow more algae and it’s able to grow at a lower moisture content and it just makes the efficiencies of the system a lot better,” according to Gangestad. He says the nitrogen in the wastewater is naturally removed. “Algae is a plant so as it grows it is taking up the nitrogen and phosphorous that it needs to grow — just like corn and soybeans take up nitrogen and phosphorous when they grow — algae does the same thing,” Gangestad says. 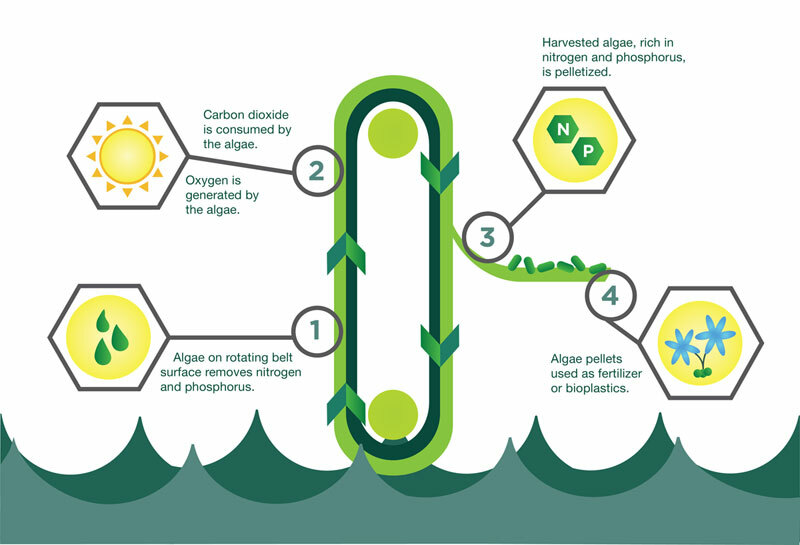 ” So, we grow algae in the water, and it takes up the nitrogen and phosphorous.” They periodically harvest the algae from the plant. “We take the algae out of the wastewater treatment plant and we palletized it and we sell it as a slow-release fertilizer,” Gangestad says. He says his company pays the city for the algae. “Small town Iowa folks don’t want to be algae peddlers — so we will have an offtake agreement with the city and we will purchase that algae from them and we will produce the algae biproduct,” Gangestad says. Gangestad says the algae takes more of the materials out of the wasewater and makes it cleaner. The program has been in the testing stages and this agreement moves it forward. He says they have numerous pilot projects across Iowa and in the city of Chicago and this will be the first system put in place to meet permit requirements. Gangestad says they are hoping the Slater operation will lead to more cities giving their system a try. “A lot of people like the idea of something, but don’t necessarily want to try it out themselves. So, we anticipate the Slater system being kind of the hurdle that we are getting over to be able to sell out system to a lot more communities and help a lot more communities,” he says. Gangestad says the system will cost the city about $4 million to install. He says that’s about $2 million less than the traditional systems. The system should be installed and ready to use by mid 2020.